Preheat oven to 450° F. Dredge chicken in flour and fry in 1" hot oil in skillet until golden brown. Drain. Return to pan. Add 1/2 of the pizza sauce to chicken and spread mixture on pizza crust, leaving a 1" border. 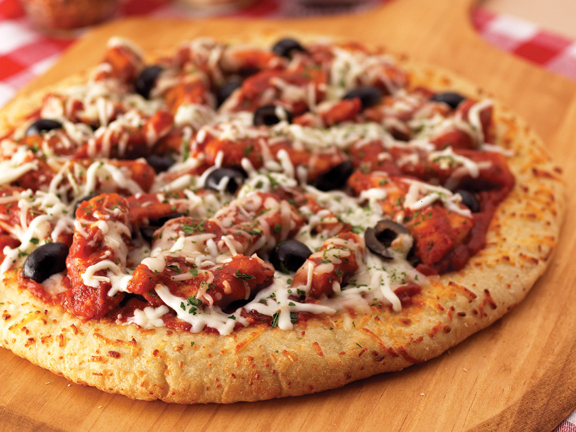 Sprinkle with mozzarella cheese, remaining pizza sauce, and olives. Sprinkle with Parmesan cheese and oregano. Bake 8 – 10 minutes on a baking sheet in the lower third of the oven. Cool slightly and serve.